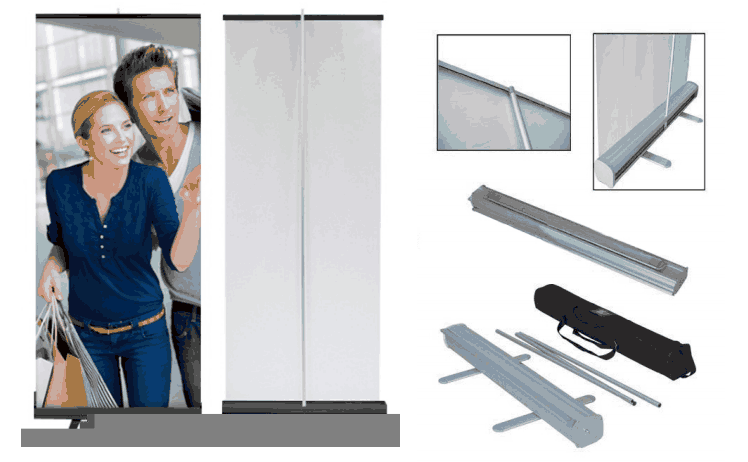 This sleek constructed portable banner display is perfect for easy and fast set-up. This product is ideal for all marketing and promotional needs. The stand is made of lightweight aluminum and designed for long term use.The FREE easy travel bag accommodates the banner display, poles and feet. Banner display can be assembled in minutes with simple easy to use directions. Portable banner stands comes with different width 33", 33.5", 36" or 39.25" and much more. Featuring a telescopic pole for adjustable banner height between 34" and 96". When not in use your banner graphic is stored inside the anodized aluminum casing which fits easily into a travel bag. Retractable Banner Display fabric comes with an opaque block-out center layer. The block-out layer results is almost 100% opacity, preventing light transmittal in normal conditions. The smooth surface also allows for printing high quality graphics. Make your Trade Show Booth stand out above the rest. Use our polystyrene which is lightweight and flexible, making it perfect for Trade Show displays. Use this material for Back Wall displays, Counter Displays, Hanging Displays, Table Top Displays, and Panel displays. This polystyrene allows for fantastic color reproduction making your exhibit stand out from the rest. X-Banner is the most cost effective display for your promotional banners. This stand is made entirely out of fiberglass and aluminum. The banner display is lightweight and durable, perfect for trade show and lobby exhibits, conference room exhibits, and much more. A FREE travel bag is included for convenient storage. We Gladly RENT TRADE SHOW DISPLAY EXHIBITS & RETRACTABLE BANNERS.